Posted on April 1, 2014 by D'Ann •	This entry was posted in humor, Polish Heritage and tagged Ancestors, Catholic, Empty Nester, Empty Nesters, Humor, Immigrants, Immigration, Indianola, Leopold Moczygemba, Panna Maria, Poland, Polish, relationships, Texas, Texas History. Bookmark the permalink. Lara’s cousin Jason linked to this post, so I found your blog. Glad I did! Love this post. Great writing. Brought back lots of memories. Thank you Pauline. Just having fun. Great to read because all applies. Ancestors were on the first ships to Indianola, not Galveston and donated lumber for first church in Panna Maria. We are pioneers of Falls City. God Bless. What is last name. I may not know you but my wife may since she is from Poth. Thank you so very much for visiting my blog and for you kind words. I was born and raised in Karnes City. My parents are Fabian and Gladys Janysek – brother Robert does water well repair in the area. My Grandmother was a Foegelle. My great uncles were both priests in the area: Msgr. 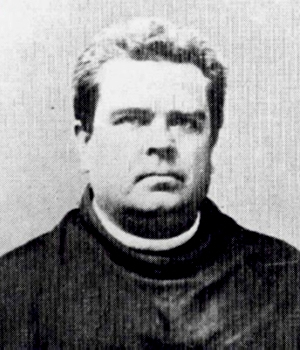 Theo Janysek served in Falls City and Msgr. Peter Foegelle served in Kosckiosko. On my Mother’s side, her Polish family migrated to New Waverly and are Stanush’s, Zabava’s, etc. I’ve always been very proud of my Panna Maria’s heritage (and my Catholic faith), so I studied it… I even taught a class on the Polish Migration at my daughter’s elementary school during their studies of European Migration to the U.S. The kids were enthralled to hear about children walking for miles, working the land, etc. Funny part I didn’t put in there… The Indianola people recored that our women were dressed rather risque’ as their ankles were showing in their Polish dress! LOL!! How honored you must be to have them donate the wood for the first church built!!! Hi D’Ann! Just came across your blog on fb. Loved it! Agreed with all the Polish traditions. They really did bring back some good memories of my wedding, other weddings, and just growing up around Panna Maria/Karnes City. Good luck with your blog! Hello D’Ann, I was looking up some family genealogy when I came across your “Polish” blog. I have to say the the explanation on being a Polish Texan is positively 100% correct. You just forgot to mention that, since being Polish, not only do you invite your close friends and family, you invite every Polish person that lives in the community. I remember when Patrick and I got married in Panna Maria, we had family reunions, class reunions, and good ol’ friendships from years past, spark up again. With over 1150 in attendance inside the P.M. community hall in 1991, wonderful memories were also made. Thanks for sharing! What you wrote is so true. Father Moczygemba is related to my mother who was a Moczygemba. I was born in Bremond, Texas which is a Polish city, not very big now but they make the best Polish sausage. my maiden name was Wrzesinski and all my grandparents came to Texas in the late 1980’s. Every year in June Bremond has the Polish Day, in polish Polski Dzien, with hundreds of people come home for the celebration. It starts with a Polish Pickle run and draws around 600 people who run for Polish prizes, like a jar of Pickles, or sausage and also for money. Then they have a parade with a big bunch of floats with the residents of Bremond decorate and they throw candy to the kids. I attended 12 years of school there. Grades 1 to 8 at St. Mary’s Catholic School and then the Public High School. I lived on a farm all those years and helped with the crops. I was the youngest of 10 children, two of my sisters were nuns. I and one of my sisters are still alive. My sister is 93 years old and lives in Houston. After I graduated from High School I left the town and moved to Fort Worth Texas because there was no opportunity to get a job to support myself. I had 4 brothers who lived in Fort Worth so that is why I moved there. Then I got married in 1958 and I have 7 children, 17 grandchildren and 9 Great Grandchildren with 3 more to be born later this year. I love being Polish and Catholic. My husband passed away in 2003.